I've had a bit of a love affair with fennel in the past couple years. Many have turned it down considering it a second rate vegetable. As recently as last week I was asked "How can you like its anise flavor, it's so overpowering?" I think I slightly blushed. I sometimes have a whole fennel bulb for lunch, sliced in paper-thin slices, and lightly drizzled with extra virgin olive oil and sea salt. Does that make me weird? I think it might, but regardless, I stand by my vegetable. Fennel tastes differently when it's eaten raw, grilled or roasted. If you're not big on the anise flavor, enjoying fennel grilled is a good way to go.. and with goat cheese too, it's really hard not to like. Preheat your oven to 400 F. Slice the fennel lengthwise into 1/2 inch slices taking care to keep it intact. Drizzle with olive and the dried oregano and season with salt and pepper. Lay out on parchment lined baking sheet. Cook for 5 minutes. Take the fennel out and turn on the broiler. 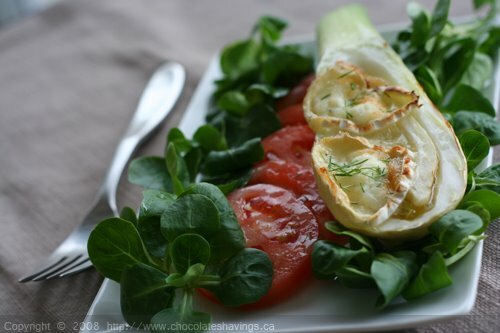 Add 2 to 3 slices of goat cheese on each fennel piece and return the baking sheet to the oven. Cook for another 5 minutes or until the fennel is soft and the goat cheese nicely golden brown. Serve atop of the mache and sliced tomatoes. Drizzle with extra olive oil, salt and pepper. Enjoy! Maybe a tiny bit weird to have fennel for lunch (unless there are accompaniments), but I love the goat cheese treatment. Fennel is most definitely overlooked! I've never had fennel raw actually. I've only used it in stews. This looks really good. I should try this! This looks gorgeous! I fell in love with fennel after moving to Europe, and it's one of my favorite vegetables now. Beautiful salad!! I definitely share your love of fennel -- it's so delicious and elegant! I am one who doesn't love the anise flavor, but I've never tried grilled fennel. I need to try it now! Wondeful. Fresh and delicious. I love fennel, in every shape and form. Naysayers should give it try! Oooh la la. So very French. I always forget about this humble veggie. I must try your recipe. Beautiful salad. I love the flavor of fennel in a raw salad, it's so fresh and crisp. I just stumbled upon your blog- such a gorgeous space! I've started to like fennel recently when it's shaved thinly in a salad with herbs and dressing. Although if I was served your salad I would jump straight in, it looks fantastic and vibrant! MMMMM.... so healthy & delicious!!! What a great idea ! I will have to try the cheese in the fennel..I love it also.Thank you.